PUERTO AYACUCHO, Venezuela , Nov 26 2013 (IPS) - The presence of the Revolutionary Armed Forces of Colombia (FARC) is evident in Venezuela’s Amazon region, where the guerrillas can be seen on speed boats, in camps, or interacting with local indigenous communities. “We see them once in a while passing by in a boat in the evening, dressed in green, armed, carrying supplies,” a veteran boatman, Antonio, told IPS standing next to the dark waters of the Cuao river, which runs into the Orinoco river in the southern Venezuelan state of Amazonas on the Colombian border. Guainía river, which forms part of the border, “when the food for the Mercal [the government chain of stores selling food at heavily subsidised prices] arrives, part of it goes to the guys in the FARC,” a local told Catholic Bishop José Ángel Divassón, vicar apostolic in Amazonas. And in Atabapo, another border town, “the FARC keep order and prevent theft,” while in indigenous communities “they try to set up camps and recruit young guys, who they offer work for three years,” he added. 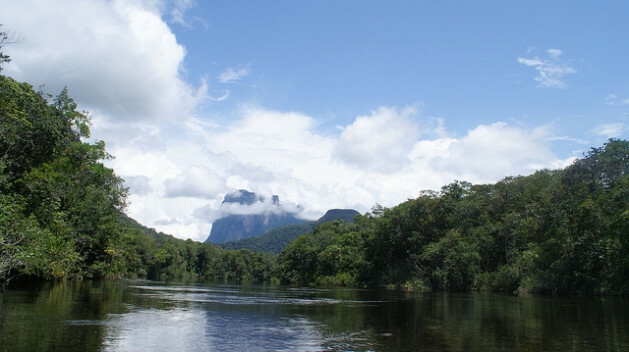 Amazonas is a mineral-rich rainforest state with abundant rivers in southernmost Venezuela. Its huge 184,000-sq-km territory is home to just 180,000 people, 54 percent of whom belong to 20 different indigenous groups according to the 2011 census. The presence of armed groups from Colombia is the latest affliction for this region which already suffers from isolation, a dearth of basic public services, and a lack of interest in its voters at election time, due to the sparse population and high poverty level. The local environment and traditional indigenous ways of life have long been vulnerable to the impacts of activities such as illegal gold mining, which is only the most visible. Amazonas governor Liborio Guarulla, an indigenous man who is a veteran left-wing leader opposed to the country’s leftist central government, estimates that there may be up to 4,000 Colombian guerrillas in this vast state. The FARC, which took up arms in 1964, is the oldest left-wing insurgent group in Latin America. Since November 2012 it has been involved in peace talks with the Colombian government in Cuba. In May, FARC rebels under the command of Antonio Medina made contact with leaders of the Uwottyja or Piaroa indigenous community, who live along the middle stretch of the Orinoco – Venezuela’s biggest river – and its tributaries, to establish a cooperative relationship, José Carmona, the shaman of the Caño de Uña community, told IPS. “We told them no, that both their presence and that of the miners offend our traditions because we are peoples who want to live without weapons – we only have machetes for our crops and shotguns for hunting,” Carmona said. The Uwottyja also said they rejected trading with the FARC “or the hiring of indigenous persons” by the guerrillas, and urged the insurgents “to find a way to return to your country”. Other local indigenous people such as Uwottyja schooteacher Juan Pablo Arana and Yanomami health worker Luis Shatiwe say the guerrillas are aggravating the problems faced by native communities in obtaining supplies, because in order to acquire food, fuel and other goods indigenous people have to compete with those who smuggle contraband across the border. “We travel hours to get flour, sugar, oil, rice or coffee, sometimes going all the way to Puerto Ayacucho,” Arana told IPS in the Raudal de Seguera community at the foot of the Autana tepuy – a mountain with vertical sides and a flat top – which is sacred to his people. Venezuela’s gasoline is the cheapest in the world at 1.5 cents of a dollar per litre. But prices here suffer from other kinds of distortions. A 200-litre barrel, which costs 20 bolivars in Puerto Ayacucho – as much as a can of soda – “costs thousands of bolivars on the upper stretch of the Orinoco, up to 8,000 or 10,000. Indigenous people’s canoes are closely inspected by the military, but apparently they let the boats of the miners or smugglers go by,” Shatiwe said. Hundreds of small-scale miners pan for gold in Amazonas, even though mining is banned in this state. What does reach Amazonas is the sharp political polarisation seen in the rest of the country. The sheet metal roofing for homes in indigenous communities is red if it was donated by the government of President Nicolás Maduro, or blue if it came from Governor Guarulla.